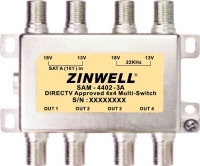 Zinwell Multi-switch Model SAM4402-3A is designed to distribute 2 polarizations (usually RHCP and LHCP or V/H) from 2 satellites to up to 4 IRDs. Polarization selection is by 13V/18V LNB voltage switching. Satellite selection is by a 22KHz tone on the LNB voltage which is present when the second satellite is required. No power supply is required as the IRD's voltage is passed to the desired LNB. Only the desired LNB is powered (switched by 0KHz or 22KHz), the IRD's power supply is not overloaded. *      Provides signals from two satellites to up to four receivers. *      Use this device to hook up four receivers to a two satellite dish (with 4 coax connections) or to two dual-LNB dishes where each dish is pointed at a separate satellite. *      Powered by satellite receiver(s). *      Passes power to satellite dish(es). *      Built-in amplifier for DSS signals. *      Does not "diplex" UHF/VHF signals.